When clients first come to see me they rarely express an interest in learning about their core values. But many people first contact me because they feel that something is missing in their lives. They might have a decent job, a lovely home and good friends and family but still they do not feel completely fulfilled or truly happy. They are not depressed. They don’t need to see a doctor or a psychotherapist. They don’t want to be prescribed drugs. But somehow they sense that there should be more to life. And they may even feel a little bit guilty for not being more content. The first thing I will try to do is to reassure my clients that there is nothing to feel guilty about. To me, everyone deserves to lead the fullest and most enriched life possible. And if you feel that something is missing in your life, the reason is because it’s true. Something is missing! 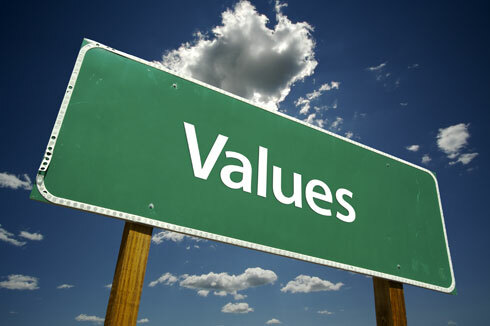 And what is missing can be attributed to one simple cause: One or more of your core values is not being met. So the first step in all of my coaching programmes is to establish what your core values are. This is essential before you can begin the exciting process of re-shaping your life to meet your values more fully. Most people have around 12 core values that must be met in order for them to lead a full, happy and stress-free life. But no two people have exactly the same values. In fact, everyone is as unique as a snowflake. Even close friends who appear to have many things in common will in reality almost certainly have very different values. And although there are four broad categories, some people might have most (or even all) their core values from a single category. Think about the difference knowing someone’s core values could make to you. For example, imagine that two new colleagues come to work in your organisation and both are the same age as you. Superficially, the two people might even look alike. But then you are informed that one person’s most important values are love, caring, making a difference and creativity; whilst the other person’s are praise, knowledge, health and adventure. Immediately you would know how differently you would need to treat those two people in order for them to be happy around you. Now think about how difficult it would be to keep them happy if you treated them both the same or (as many people do) assume that they have the same core values as you do. Finally think about yourself: How can you know how to be happy and fulfilled in your own life if you don’t know your own core values? It only takes an hour long session with Horizons Life Coaching to reveal your core values. But the benefits can be felt for a lifetime. Call 07905-929-953 now to book your free introductory session.